Sign Up Today for the 12th Annual Minneapolis Bike Tour! - Minneapolis Riverfront News - Minneapolis Riverfront Neighborhoods. 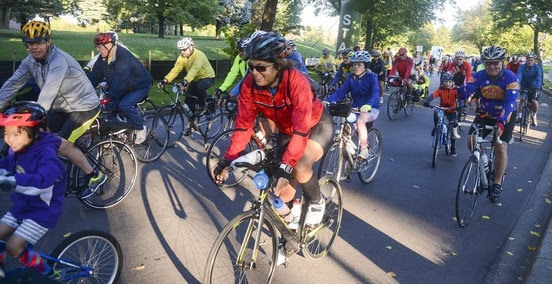 Come experience the beautiful parkways that make Minneapolis the best place to bike in the country by participating in the 2018 Minneapolis Bike Tour! Spanning the Grand rounds Scenic Byway System, the Minneapolis Bike Tour is a family-oriented, recreational tour that is great for all ages and abilities. The tour will take place on Sunday, September 16, at 8 am, with a picturesque start and finish line area at Boom Island Park, 724 Sibley Street NE. There are two routes to choose from; 16-mile and 32-mile, both of which are closed to motorized traffic. All routes include stops with refreshments and bike mechanics. Stick around after the ride to enjoy live music, beer for participants 21+ (must show ID), courtesy of local Utepils Brewing, food from local vendors, exhibitor booths and bike tour merchandise for sale. Check out our tour video on our Minneapolis Bike Tour Facebook page and sign up to ride today!